We’ve collected a a handful of examples of what language-rich environments in this Flickr set. 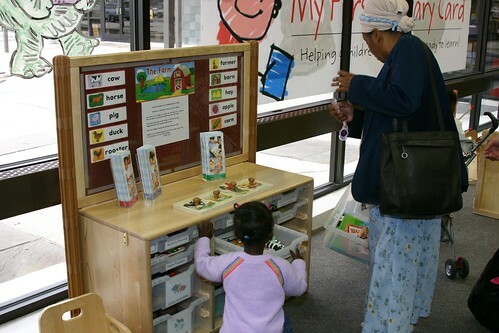 Among Saroj’s examples is the Rancho Cucamonga (Calif.) Library’s Play and Learn Islands™, interactive exhibits that encourage purposeful play. Play projecst like Discovery Dig, Big Build, and IlluminART develop skills in problem solving, sorting, sharing, early literacy, and collaboration. The colorful design, scale and varied activities appeal to a range of ages, encouraging families to play and explore together. Check out the library’s Flickr set. When a friend mentioned using sign language with his toddler, the trend was news to me. I now know that thousands of hearing parents teaching their hearing children basic signs. Nonetheless, I was skeptical when Kathy MacMillan, an ALA Editions author and storyteller who also happens to be a certified American Sign Language interpreter, proposed an ALA Editions Workshop on signing in storytime. What’s with this? I asked in an email message. Is it a Baby-Mozart thing? Kathy’s reply was impassioned. In fact, research shows that signing with young children stimulates both spoken AND signed language development, decreases frustration, enhances bonding, and promotes early literacy. (The books Sign with Your Baby by Dr. Joseph Garcia and Dancing With Words by Marilyn Daniels summarize the research.) I attribute the widespread interest in signing with babies and young children to the fact that it works! When a child can tell you what he or she wants by signing instead of screaming, amazing things happen. Giving a young child the power to communicate can even save a life: a colleague of mine who teaches baby sign language classes in Arizona had an 18 month old girl in one of her classes who was bitten by a baby rattlesnake while playing in the garden with her mother. Her mother didn't see the snake, and because the bite was so small she assumed it was just a bug bite. Only when the little girl kept signing "snake" did the mother realize what had happened. The girl survived, and if that story doesn't illustrate the benefits, I don't know what does. The goal of ALA Editions Workshops is to offer practical, actionable knowledge while promoting discussion, learning, and information sharing. The relatively small audience supports focused, discussion through the chat window. We assign homework too! For ideas on how sign language can enliven your programs, see Six Super Ways to Use Sign Language in Your Programs, which is one of the preliminary readings for Kathy's Workshop. Inspire patrons to reuse things they’d ordinarily throw away. Not only does this help the planet, it also fosters creativity, a quality many children don’t cultivate because they spend so much time with technology. This activity can take place on one day, or you can provide a regular table for make-and-take crafts, varying the project regularly. Display books featuring crafts made from recycled materials (along with examples of the more complicated projects, if you want to make some). Set up an area in the library where interested patrons can make some of the simpler crafts to take home. Post directions with the materials, or have someone available to help people. If you lack staff for this activity, try recruiting volunteers. Some high schools have environmental action clubs, whose members might make sample crafts ahead of time and/or work at your event. Use these super simple ideas, or consult books from the list below. Each issue of Highlights Magazine for Children also offers crafts made from household objects. If the library doesn’t have enough materials, solicit donations through newsletters and posters. Children cut off the corners of reply envelopes from junk mail and decorate them with stamps or crayons. Children cut old calendar pictures into four to twelve pieces, depending on the picture’s size and the degree of difficulty they want their puzzles to have. Provide reply envelopes from junk mail for storing each puzzle’s pieces. Play Bingo with an old calendar. Tear off the pages for three months. Make sure at least two start on different days of the week. Cut apart the squares for one month. Mix them up. Spread them out facedown in the middle of the playing area. Each player puts one of the other months in front of him/her. Store the pages and squares in reused mailing envelopes. Anton, Carrie. Earth Smart Crafts. Bone, Emily. Recycling Things to Make and Do. Burke, Judy. Look What You Can Make with Paper Bags. Chapman, Gillian. Making Art with Packaging. Jones, Jen. Cool Crafts with Newspapers, Magazines, and Junk Mail. Kohl, MaryAnn F. Art with Anything. Nguyen, Duy. Junk Mail Origami. Ochester, Betsy. Look What You Can Make with Egg Cartons. Redleaf, Rhoda. Learn and Play the Green Way: Fun Activities with Reusable Materials*. Richmond, Margie Hayes. Look What You Can Make with Paper Plates. _____. Look What You Can Make with Tubes. _____. Every Day is Earth Day. _____. Look What You Can Make with Dozens of Household Items! _____. Look What You Can Make with Newspapers, Magazines, and Greeting Cards. _____. Look What You Can Make with Plastic Bottles and Tubs. Siomades, Lorianne. Look What You Can Make with Boxes. Sirrine, Carol. Cool Crafts with Old CDs. _____. Cool Crafts with Old Jeans. _____. Cool Crafts with Old T-Shirts. _____. Cool Crafts with Old Wrappers, Cans, and Bottles. Sullivan, Susan White.The Big Green Book of Recycled Crafts. Warwick, Ellen. 50 Ways to Get Your Carton. Young, Karen Romano. Science Fair Winners: Junkyard Science. 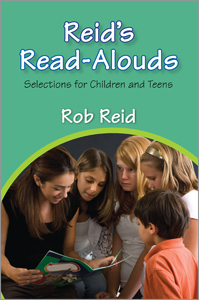 I just got done proofing the galley for Reid’s Read-Alouds 2: Modern Day Classics from C.S. Lewis to Lemony Snicket, the companion to my Reid’s Read-Alouds, which was published by ALA last year. I had a great time with this project, too. It gave me the chance to re-visit titles from my childhood as well many published during my children’s childhoods, and I found many wonderful books to share aloud with groups. As I did in the first book (and do in my Book Links “Reid-Alert” column), I included a “10 Minute Selection” for each book. I hope that gives you the perfect place to start book sharing. I can now turn my attention to my next book–a companion to Something Funny Happened at the Library. I opened that first book with the following statement: “My job is to make kids laugh.” I still feel that way. If I can make them laugh, I have their attention. If I have their attention, I can lead them to wonderful forms of literature and storytelling, which eventually leads us to the library. 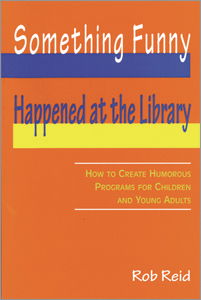 The new book, tentatively called Something Funnier Happened at the Library, looks at humorous books that have been published since the first book arrived. In addition to several new story-program lesson plans, I’ll highlight aspects of humor not found in the first volume---for example, humor in graphic novels and in young adult books. I definitely think a new companion book is needed. When I went through the first book, I was dismayed to find that many of my favorites (including Margie Palatini’s The Web Files and Sing Sophie by Dayle Ann Dodds). Luckily, there new authors, illustrators, and titles to fill the void. Mo Willems, for example, wasn’t around for the first volume. He has certainly taken the humor children’s literature category by storm. As I’m typing this, he has two books on the NY Times Bestseller List: his third Knuffle Bunny book and another Elephant and Piggie easy reader. And this isn’t the first time Willems has had multiple titles on the bestseller lists. So, I’ll be spending a lot of the next year reading funny children’s and teen books, so I can share them with you. I’ll be including “Laugh Out Loud Moments” for most chapter books I list (similar to my “10 Minute Selections” for the Reid’s read-aloud projects), and I’ll be creating funny, ready-to-go story program lesson plans. I like this job! Look for the book sometime in 2012. Sorry to make you wait. I have a lot more reading to do!